Situated just one block west of the archi­tecturally rich University of Chicago, the DuSable Museum of African American History is undertaking a major preserva­tion effort. 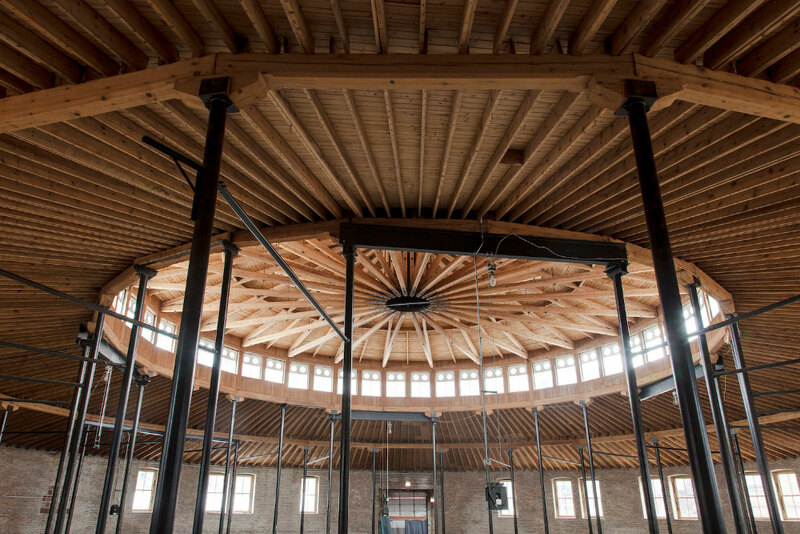 Located directly across from the Daniel Burnham–designed DuSable, the Roundhouse, a former horse stable also designed by Burnham, has laid vacant for over 40 years. Yet over the past de­cade, the DuSable Museum has worked to convert the heavy timber and stone struc­ture into additional exhibition space. The DuSable Museum began work­ing on converting the building in the mid- 2000s only to have the project stall thanks to the economic recession in 2008. By 2009, a renovation of the building’s exte­rior was complete, but the interior was left far from the museum-quality space the DuSable was hoping to achieve. To bring the 61,000-square-foot space up to mu­seum standards, it would cost upward of $35 million. Unable to raise those funds, the project has taken a new direction, which will see scaled-back goals complet­ed in the coming years. Starting with a $582,000 outdoor space, the Roundhouse is now able to host events and exhibitions for the first time. Designed by Chicago-based Site Design Group, the outdoor area is the first step in connecting the Roundhouse to the mu­seum’s main building with a pedestrian-friendly landscape. At the same time, the interior of the building has been cleaned, and has already hosted its first major art event. Though the original plan to convert the interior into white-wall galleries has been put on hold, crowds happily flocked to catch a glimpse of one of Burnham’s most utilitarian projects. 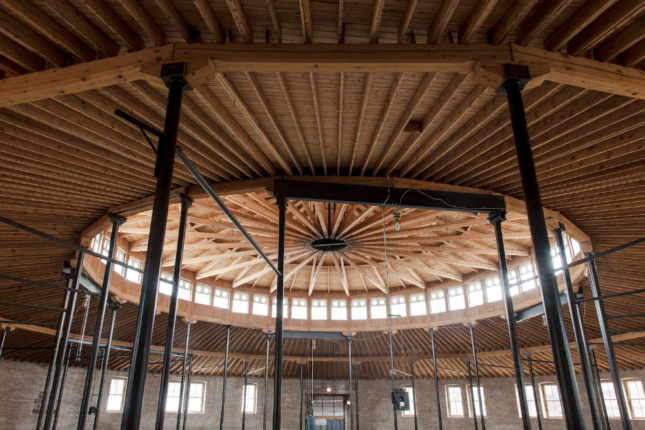 Unable to convert the Roundhouse into whitewall gallery space, DuSable opted to leave the interior in its original timber and iron form. 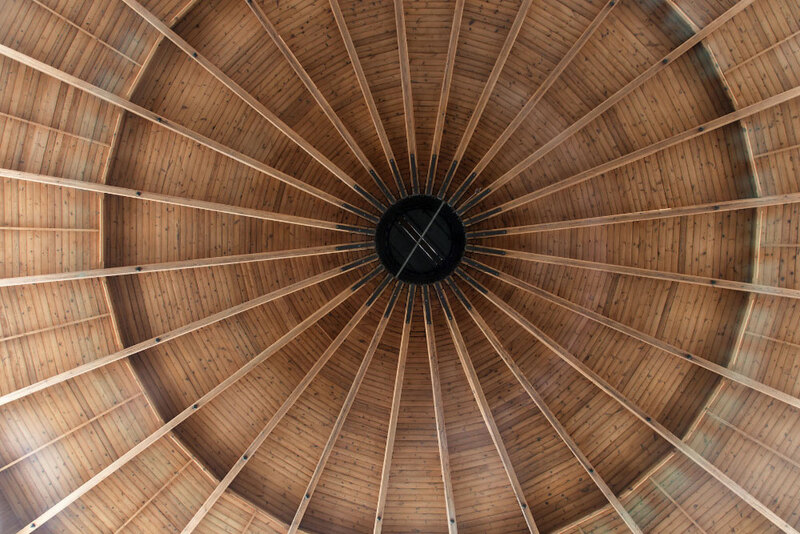 Much to the joy of architects and pres­ervationists alike, the soaring heavy timber dome has survived in excellent condition. The web of large pine timbers is support­ed by the limestone walls and cast-iron columns, which all look as though they were recently constructed. At 150 feet across, the space is a welcome addition to Chicago’s catalogue of impressive civ­ic interiors. The Roundhouse was the site of this year’s edition of EXPO CHICAGO, which hosted large-scale installations curated by Paris’s Palais de Tokyo. Coinciding with the opening of the Chicago Architecture Biennial, the exhibition, Singing Stones, commissioned Chicago- and Paris-based artists to create massive works. The height of the space allowed for tall hanging piec­es, while the round walls intensified an­other work, which utilized ambient sound. Yet another installation addressed the few windows, a clerestory near the dome’s pin­nacle, with colored films, filling the room with rainbow light during the day. While the Roundhouse may never reach the level of museum refinement and environmental control previously planned, it will continue to be updated and made ready for more exhibitions and events. It is currently scheduled to be complete by the time the Barack Obama Presidential Cen­ter opens on the other end of the University of Chicago’s campus in 2021. The DuSable has already begun conversations with the center to ensure exhibitions in both insti­tutions are complementary. Until that time, architects can only hope the museum will occasionally open as it has for EXPO, let­ting the world in to see just how architec­tural a horse stable can be.